Only 33% of B2B marketers say that they have an effective lead nurturing process. According to a 2011 DemandGen report, 67% of all B2B companies are scrambling to introduce new leads into their sales cycle, creating a chaotic situation and impairing effective lead response. A systematized process that moves prospects through the sales funnel isn’t just a good idea, it’s a necessity for companies to grow. Even more so, a lack of a systematic lead nurturing process wastes resources by tying up a company’s most important asset for sales: the sales team. To add insult to injury, there’s been a seismic shift in how customers now enter the sales funnel, with a large percentage of leads coming from online search queries. In the past, salespeople initiated the sales process and had complete control over it, but now the customer holds the reins. Without a strong lead nurturing system in place, these prospective buyers may or may not see the information they need to become a customer, and sales will be lost. 50% of sales go to the vendor who responds first to a lead query. Now, instead of finding leads, one of a company’s highest priorities is responding to them – and quickly. Unfortunately, the time and resources needed for that aren’t always available, and a solution needs to be in place to capture potential sales when the sales team can’t respond immediately to every inquiry that comes into the pipeline. Traditional methods are still around, but they’re expensive and pose problems that interfere with productivity and resources. Phone calls are time intensive, and the amount of leads generated from a strong inbound marketing campaign is quite likely to be too high for individual follow-ups. The other problem with B2B lead generation is that only a small percentage of leads are valid, and an even smaller percentage are qualified and ready to buy. Research firm Gleanster states that only 25% of incoming leads are valid, and of that 25%, half of them are qualified but not yet ready to make a purchase. So, the problem becomes “how do you best use your sales team’s time and effort to close sales, without neglecting leads that aren’t as far along in the sales funnel?” That’s where marketing automation through email comes in. 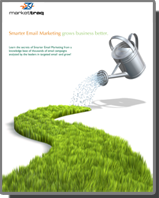 Lead nurturing emails get 4 to 10 times the response rate of generic email blasts. Leads are responsive to follow-up messaging – even if it isn’t as personal as a one-on-one sales call. In fact, a separate study by Genius.com found that 66% of buyers cite “consistent and relevant communication by the sales and marketing organizations” as a key influence in choosing a service provider. And a number of studies have shown that automation shortens the sales cycle, allowing companies to market to a much larger pool of leads in a shorter amount of time for a lot less money. An even bigger benefit is the ability to segment your messaging based on a number of different prospect behaviors. For instance, targeting clients who showed interest in a specific product or service with targeted content designed to convert. Email gives B2B companies the ability to provide timely and relevant information along to prospects to easily graduate them to leads, which the sales team can then turn into customers. In short, automation allows for a more efficient use of both financial and human resources. Midmark, a MarketTraq user, experienced this problem firsthand when searching for a more effective way of dealing with incoming website leads. As a healthcare manufacturer dealing with high ticket items, traditional tactics had long been the method of choice for sales outreach and nurturing. To deal with an increase in online leads, the healthcare giant needed to find a way to interact with and guide their new leads through the initial phases of the sales funnel. They did that in large part through automated emails, but more importantly, they used database marketing and email marketing to segment their leads and send targeted messaging to each prospect based on which products the prospects were viewing on the Midmark website. This type of mass-customized messaging is only possible through smart email marketing and it’s the most effective and efficient way to automate the lead nurturing process.